Brazil’s Amazon is home not only to the world’s largest tropical forest, but also one of the world’s largest mangrove areas. Mangroves are collections of different tree and shrub species found in tropical coastal regions, growing in waterlogged soils. They can be recognized because of their large roots protruding from soils—roots they use to ‘anchor’themselves from strong incoming tides. There are over 80 distinct mangrove tree species, and can sequester or store large amount of carbon in their soils, which can be stored for multiple centuries. 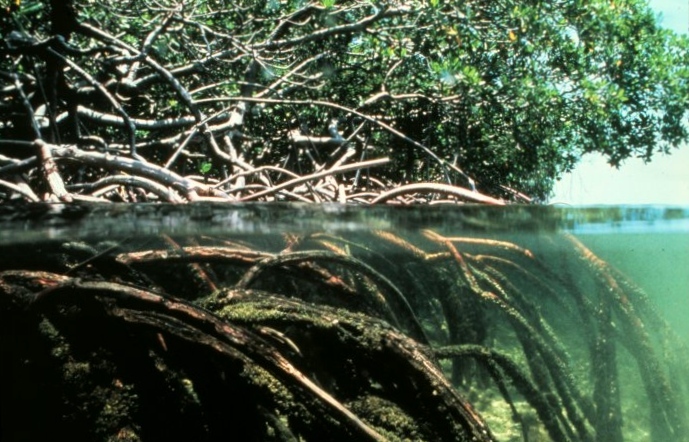 Deforestation of mangroves results in the release of sequestered carbon dioxide, as trees, plants, and soils release stored carbon once they are logged and cleared or burned. Although mangroves represent only 0.6% of global tropical forests, a new, long-term study published in the journal Biology Letters shows that these mangrove forests contain much more stored carbon than previously thought, and that their deforestation accounts for as much as 12 percent of greenhouse gas emissions produced by all tropical deforestation worldwide.